IDF troops gather outside Gaza, begin preparing for ground invasion. 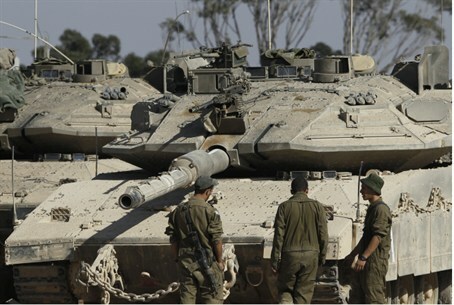 IDF commanders began Friday morning to brief their troops in advance of a possible ground operation in Gaza. Thousands of reservists have been called up for duty, and a total of at least 16,000 will be summoned for service. While troops gathered outside Gaza, terrorists in the area continued their attacks on civilian communities in southern Israel. More than 40 rockets have been fired since Friday morning. At least two rockets were fired at the city of Be’er Sheva. The Iron Dome system successfully shot them down. Four rockets were fired at Ashdod shortly before 11 a.m. They, too, were shot down by Iron Dome. Earlier in the morning terrorists fired a rocket that hit next to a residential building in the city, causing damage and sending four people into shock. A short time later, terrorists hit a broadcast truck with an anti-tank missile. The truck went up in flames, but nobody was injured. A kibbutz in the region lost 5,000 chickens when a rocket attack took out the town’s electricity, causing temperatures in the chicken coop to drop dangerously low. The IAF has hit 250 targets in Gaza, most in pinpoint strikes that did not cause injury.